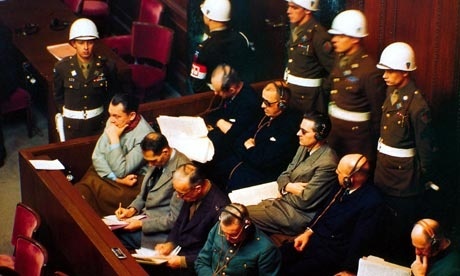 In this chilling collection, The Nuremberg Interviews: An American Psychiatrist’s Conversations with the Defendants and Witnesses, Leon Goldensohn shares his exhaustive notes and interviews from his time as the prison psychologist in charge of monitoring the two dozen Nazi officials on trial for genocide. Reading these interviews is unsettling, to say the least. Doenitz’s telling response opens the Holocaust up to some interesting moral and philosophical questions: when, in fact, are we responsible? Like Doenitz, are we only responsible for our assigned tasks, for carrying out the orders of those above us? Or do each of us possess a weightier responsibility, a responsibility to speak out against all villainy and evil?